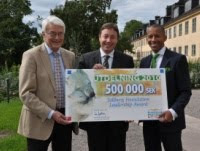 A news item which has received scant attention in Pakistan is the donation by Mr Achim Steiner of his entire prize money ($70,000) for the benefit of flood relief victims in Khyber Pakhtunkhwa (KPK). He is currently the head of the United Nations Environment Programme and was recently awarded a 2010 Tallberg Foundation Prize in Stockholm. This noble gesture is both significant and praiseworthy since, like the donation of Angelina Jolie, it surpasses the combined personal donations by the two richest sons of the soil; one currently the president, and the other aspiring to be the next prime minister of Pakistan for the third time. The Tallberg Prize is given to an individual who has consistently applied humanistic, social and ecological values to his/her endeavors. The prize encourages and supports leadership traits and articulation of consistent values, which in all, is the essence of principled pragmatism. Not long ago, Mr Steiner spent over three years in Swabi, Pakhtunkhwa as an environmentalist. It is that period which Mr Steiner remembers with fondness when people of the region, themselves with meagre resources, opened their hearts to their guest from a land far away. It is humanity at its best and transcending all geographical, national and ethnic frontiers when Mr Steiner, in his hour of glory at Stockholm, remembered the poorest of the poor in KPK in their hour of grief and distress. Mr Steiner indeed went far beyond that personal gesture when, in his acceptance speech at the award ceremony, he called for a spirit of solidarity and generosity to assist the people of Pakistan in this crisis. He aptly emphasized that while the immediate response and needs of people should be the focus of our attention, the nature and scale of this disaster also provided a stark reminder of the need to address the causes and consequences of environmental change on our planet. The fact that he chose to express these sentiments with the full knowledge that Pakistan's powerful elite have been far less sensitive to the miseries of their own people, is a sad commentary on any value that we may attach to the wellbeing of the downtrodden. If widespread perceptions, that at some places the dykes were breached for self-serving interests with complete disregard for the lives and meagre ownerships of the poor, are correct, it would be nothing short of an inhuman and criminal conduct, worthy of exemplary punishment under the law. While this deluge may be over, there is always a danger of other such natural disasters looming around the corner. Mr Steiner has therefore correctly sounded the warning that vulnerability of societies - particularly the poor ones - to impacts of these changing phenomena such as climate change and degradation of our ecological life-support systems, continues to grow. This is a warning which we would be hard put to ignore for our collective national wellbeing. The people of Pakistan deserve better answers for the future and at a time when we have a fairly good idea of what happened to us and how we responded to these challenges. The fact that he chose to transfer the funds to a Pakistani NGO in the province rather than the federal government, is yet another blow to the credibility of our rulers. But it is futile to touch upon this subject any more since change for the better in the government's policies is as unlikely, as to expect the mighty Indus to start flowing upstream. The inhabitants of Swabi remember Mr Steiner as a kind and sensitive person who wished to see a change in the identity of the poor with whom he shared mutual experiences in their hujras (Guest Houses) and mudflat houses. He understood the deep pain and deprivation of the Pakhtoon people. He wanted the Pakhtoons to be identified differently than being associated with the hardest and lowest social hierarchical trades, which they are constrained to adopt in the search for livelihoods all across Pakistan. One wonders if the current rulers of KPK would spare a thought to Mr Steiner's desires to bring about a meaningful change in the lives of the people of their province, and not merely play around with their sentiments and emotions. Another aspect which someone noticed during Mr Steiner's long stay in KPK was his concern for its youth drifting away into drugs, as helpless mothers and wives crooned an anti-drug song by an unknown Pashtu singer in their sad voices : 'Woi guttey khey pravezey, che bhang cha kareloo wu naa' (Cursed be those who sow this despicable crop). As always, emotions stemming from the inner sanctums of the heart are extremely difficult to translate; this being no exception. Would the KPK rulers be moved by the sadness in the voices of these unfortunate women, who are symbols of honor of course, but not much else. Thank you Mr Steiner for the gesture which will always be remembered in the same vein in which it was made. KPK's mudflats and hujras, not to mention the hearts and hearths of the poor, will always remain open to you should life ever bring you again to these wonderful people.